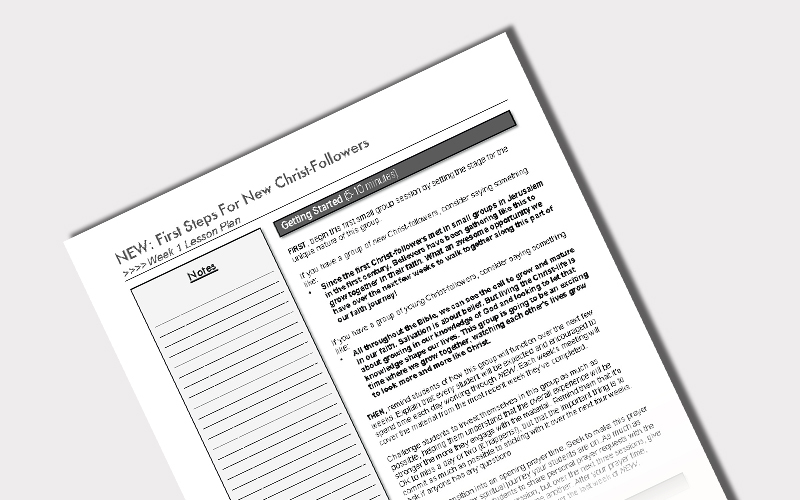 NEW: First Steps for New Christ-followers, one of the most used new believer resources in youth ministry, was re-released recently with a fresh, new look and updated content! One of the most used new believer resources in youth ministry, this powerful 4-week devotional experience will help your new believers get off to a strong start on their new journey with Christ. When students give their lives to Christ, the Bible is pretty clear: They. Are. NEW! But what does it mean to be NEW? What does it mean to see God in a NEW way? What does it mean to live out the call to follow Christ? These questions can be daunting ones in the lives of the new or "young" Christ-followers in your youth ministry. New: First Steps is a powerful journal that will help answer these questions and will help students take the first steps on their new journey with Christ. NEW is the second devotional experience in our New/Next/Now Discipleship Series. To learn more about, and to purchase the entire series, please click here. In this video, Andy Blanks gives an overview of New, and provides a glimpse into why it was such an exciting resource to produce. Download the Introduction and the entire first week of dynamic daily devotions from New. Grab some details about the awesome (and free) Small Group Leader’s Guides for New. This Leader’s Guide turns NEW into the “out-of-class piece” for a 4-week Bible Study. And it's free. Full download available on page 9 once purchased!